Amanda enjoys the "cuteness" of the new hotel. July 18: Once again, I decided to take a zero day. I didn't want to take a zero day, but it was necessary to build up a backlog of these blog posts. 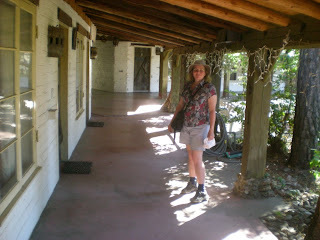 The next trail segment would have required another 30-mile hike in order to reach the next paved road--certainly possible, but it would have taken all day to do those miles, and I needed to type up blog entries. This day, I got my blog entries padded through September 2nd, The Most Dangerous Day of the Trail. We also changed hotels. There was nothing wrong with our old hotel, but Amanda found another one that was slightly cheaper and, more importantly, "cuter." I have to admit, the new hotel was a lot more cute than the old one. The old one was functional. The new one was cute, but also functional. The old one had a mini-fridge, but the new one did not. I do like the mini-fridge..... Our new hotel had a little creek running through it. Our old one did not. 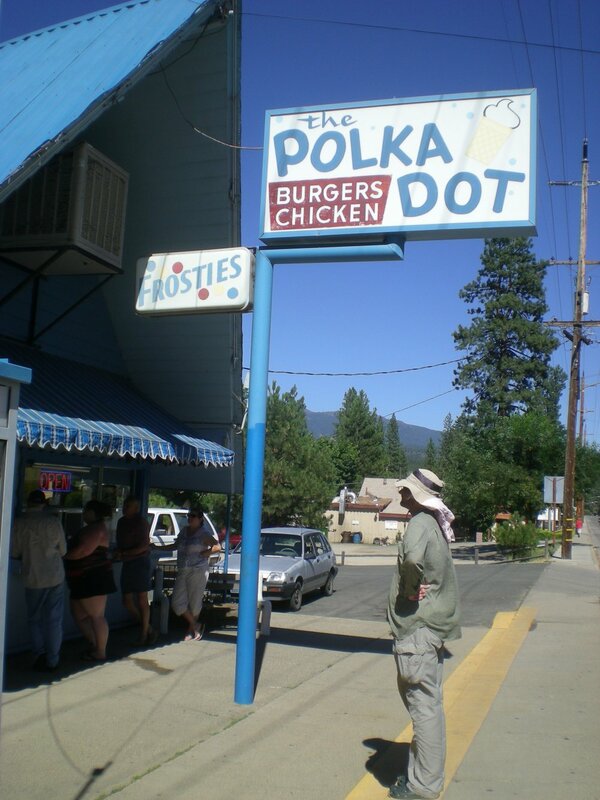 I wait for our order at the Polka Dot. 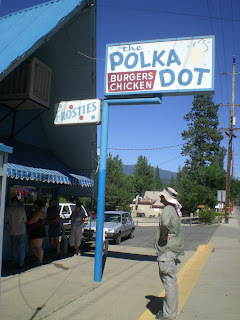 For lunch, we walked across the street to the local burger joint, the Polka Dot. I kid you not. =) I ordered ice cream, a burger, fries, and a drink. Service was annoyingly slow. I think they had to kill the cow first or something. And after typing up the last of the blog entries I needed to type up, that left a few hours for me to surf the web and do something more enjoyable--such as catching up with the Lost episodes I'd missed. At long last, I could finally watch the series finale of Lost! As I expected, they answered nothing about the island. I didn't think they could. By the end of season one, I was onto those writers. I knew they didn't know what they were doing. I knew they wouldn't be able to tie up all of the loose strings. I somehow felt validated that my hunch was correct. =) Despite the lack of answers, however, I still enjoyed it. If I actually expected answers, I think I would have been considerably more annoyed at the ending. Heh, yeah, I was rather disappointed by the LOST finale. While I didn't expect the answers I was hoping for, I was hoping for SOMETHING of SUBSTANCE, something WOW, something at least jaw-dropping. Nope. Sigh. The first half of the series rocked though, answers or no. I just think they needed about 3 more seasons to do it justice. Sometime during all that blog logging, do you ever find the time to just catch up on sleep? I'm thinking I'd be looking for a place that could give me a foot massage, too.